So, that was my first playthrough of Final Fantasy I. Before I leave the game, a few scattered thoughts. Was it fun? Worth playing? For a gamer who can enjoy rather than chafe at the simplicity of old games, sure! It was actually more enjoyable than I expected it would be, partly due to the fact that I played the remastered version which had changed the game mechanics. I’m not sure I could’ve toughed it out through the original, which had no Phoenix Downs and required you to lug KOed members back to towns for resurrection. The story and world were pretty basic, of course, and as I noted in my “Who Are You?” roleplay discussion, the characters were more avatars than characters, as interesting as we made them out to be. The game really did have a certain charm, despite its stock fantasy simplicity; it did have many of the beloved game and story elements that have made Final Fantasy enduring. I could believe that FFI hooked enough players to rescue Square from near-bankruptcy. Even odd little things like the iconic black mage with the Jawa eyes contributed to making it just…a little…different. The retro graphics and music were good bonuses. Now, about that story. One of the fun parts of Final Fantasy fandom are the worlds, characters, and plot. This game didn’t have much of the above, and what it did have was sketchy, but there were a few interesting head-scratchers to ponder. I gather that Dissidia Final Fantasy has picked up on some of these loose ends. Momo: GREAT BALLS OF FIRE! Well, whaddya know: Ochu from Final Fantasy is really Dungeons & Dragons’ Ochu in drag! Also, the Japanese for flan is “Black Pudding,” another D&D original monster! 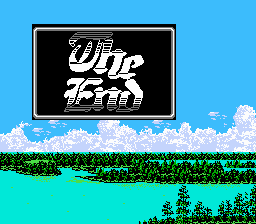 Also, the English translations in the original NES Final Fantasy are hilarious — MADPONY, BADMAN, CATMAN, to name a few. Take a look. All right, back to our playthrough! Once again, thanks to Moogle University for inspiring my playthroughs. You can read their playthroughs of Final Fantasy I here. Rei: The heck is this? Nina: Spoo looks very heroic, to be sure…but…well… shouldn’t there be four Warriors of Light? Momo: Well, see, I thought that if the Prince of Elfheim saw this, then maybe he’d be bowled over by Spoo’s bishie awesomeness! Rei: So you edited out us clowns and tried to make him look epic? Momo: Yep. And let’s start calling him “Warrior of Light” in front of the prince. It sounds a lot more noble than “Spoo,” don’t you think? Nina: That’s… very thoughtful, Momo. Rei: Hey, guys. Hold up. We need to talk. Momo: I SHALL THUNDARA YOUR SORRY SAHAGIN FISHBUTT! Rei: Right. And Spoo’s buff and all, so he don’t need magic. But I’m a thief. And a thief’s got needs. Nina: Haven’t we found enough treasure in the last dungeon crawl to keep you happy? Rei: Well, sure, if you consider weapons we already bought in the last Elfheim garage sale to be worth an hour of slogging through undead gunk. But I’ve got a job to do. Nina: Okay, okay. 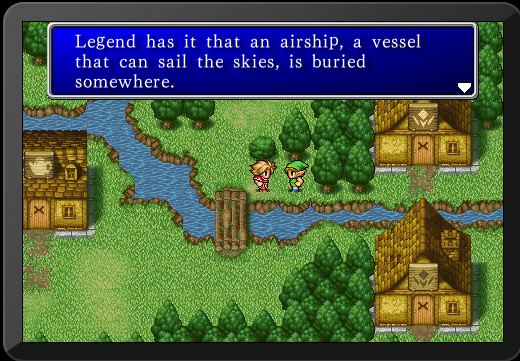 But this is one of those early Final Fantasy games. We don’t start unlocking the good skills until we restore the first Crystal. Rei: Good skills? You mean like ‘turn all undead to powder with my Dia spell’? Nina: *prim* Would you rather I left them to you and Spoo? Momo: NEVER FEAR! I’LL ROAST THEM WITH THE ALMIGHTY POWER OF FIRA! Nina: Patience, Rei. We’ve got to be getting close to the first Crystal. We’re out of the kiddie pool part of the map. I’m sure you’ll acquire a Steal ability soon. Rei: Hope you’re right, princess. 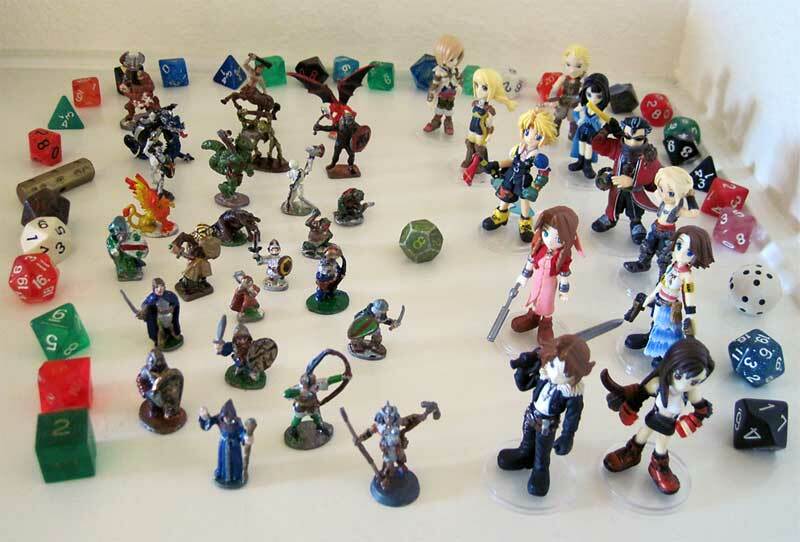 My D&D figures battle my Final Fantasy figures for the last remaining die from my basic D&D set. I had always recognized the D&D elements embedded in Final Fantasy. However, the games I played first were VIII, X, and VII, the PSX games which diverge the most from FF’s Dungeons & Dragons roots. These roots are plain to see in Final Fantasy I. Stripped clean of its successors’ additions and complexities, FFI is clearly a video game adaptation of vintage, first edition Advanced Dungeons & Dragons, just like many other video games of that period. Playing Final Fantasy I hits me with a double whammy of nostalgia, both for later Final Fantasy games and for my formative years playing AD&D as a teen and young adult. In a way, the D&D throwbacks help me know what it’s like for old-school Final Fantasy gamers revisiting the games they played as kids. Here’s just some of the D&D borrowings I noticed while playing this game. …with borrowed Breath of Fire III characters adding personality to the generic Four Warriors of Light. Comparison of 1990 FFI on NES (first English edition of Final Fantasy) vs. the 20th Anniversary Edition ported to iOS, which is what I’m playing. 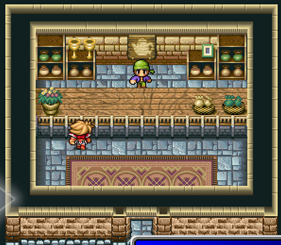 Items and Item shops in the iOS / 20th anniversary edition are symbolized by a teapot. I approve of a game that uses tea infusions as restoratives. So apologies for the peanut gallery commentary from characters whom you don’t know, but they’re fairly self-explanatory. …After a long journey, four young travelers did at last appear, and in the hand of each was clutched a crystal. Rei: Why the heck do I have a crystal? Can I sell it? Nina: It’s an FF game. We gots to have crystals. Momo: WHERE THE FRICK IS MY GRENADE LAUNCHER? My friends sev and las at Moogle University had the insane idea to replay ALL the Final Fantasy games, or at least the first ten, in a 2013 gamer marathon. I decided to join the insanity. Here commences my own ten-month-plus journey through the land of chocobos, airships, minimaps, and crazy dudes named Cid. First up on our plate is Final Fantasy, the oxymoronically-named game that started the neverending franchise in 1987. I was a teen back then, playing games like Zork, Temple of Aphshai and Karateka on an Apple ][. 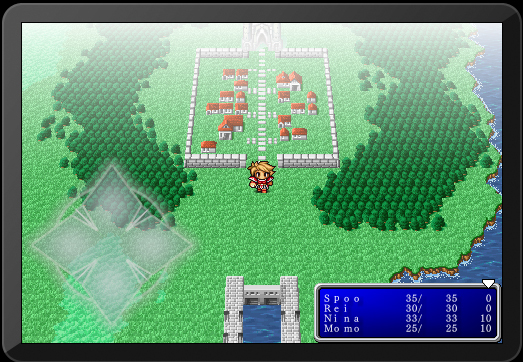 I did not discover Final Fantasy until 15 years later, so I missed FF’s old school era entirely. As I am over forty and have a life, I am violating the path of gamer purity by excusing myself from the original, delightful yet buggy NES version of Final Fantasy , which required massive amounts of grinding, dragging dead characters back to towns for resurrection (no Phoenix Downs for you, sucker! ), and conserving the precious few spells one could cast each day. Instead, I’ve opted for the kinder, gentler, EASY MODE iOS edition of Final Fantasy, which is a port of the remastered 20th anniversary Final Fantasy for PSP. * This will be my first time playing any version of this title. I’m looking forward to a lot of 8-bit and D&D nostalgia (I played tabletop D&D quite a bit in the 80s). But enough expository banter. Let’s play Final Fantasy I! *(See list of all the Final Fantasy versions on FF Wikia and this GameFAQ guide to differences between the versions).